Beautiful October is one of the best months of the year in Salt Lake City because although it's not quite ski season, the weather's still pleasant enough to enjoy other outdoor activities in the daytime and crowds are at their lowest since children are already well into the fall semester at school. In October, there's a hint of fall crispness in the air with afternoon highs in the 60s and 70s Fahrenheit, and since the crowds of summer have subsided, hotel prices take a dip at this time, too. From a host of free things to do in Salt Lake to ticketed concerts for some of the biggest names in entertainment, there's plenty of exciting things going on this month. If you are planning an October trip, check out what's happening during the month and plan to be there when your favorites events are taking place. Many area farmers markets continue through October selling pumpkins, apples, and cider—among other crafts and foods. The Downtown Farmers Market in Pioneer Park is open on Tuesdays and Saturdays into October, and its Arts & Craft Market has a different kind of local produce: artisan jewelry, ceramics, and metal and glass work. Before you go, be sure to check local listings for hours of operation and last-minute cancelations in the event of inclement weather. Oktoberfest at Snowbird starts on the first weekend in September and takes place every weekend until October 21, 2018. This annual series of events features music, dancing, traditional German cuisine, and a beer garden all at the Snowbird Resort. Here, you can enjoy a bratwurst and sauerkraut, apple strudel, and other German treats, and kids young and old can have fun with face painting, a caricature artist, inflatable rides, yo-yo demonstrations, clowns, music, and balloons. The State Room is one of SLC's favorite small music venues, bringing together local and international talent for a reasonable price all year long. In 2018, the October schedule features such acts as Dead Sara, The Steel Wheels, Tony Holiday & The Velvetones, The Church - Starfish 30th Anniversary Tour, Meg Myers, The Pour EP Release, Larry and His Flask, Good Old War, Henry Rollins, Joshua Hedley, Mason Jennings, and Donna The Buffalo. You can check the full schedule for October's performances on the venue's website to see if your favorite is performing this year. The Depot is another popular live music venue that's in the historic Union Pacific building at The Gateway. However, the Depot typically hosts more well-known artists than The State Room. In October of 2018, The Depot will host a whopping 10 shows, so you can catch one no matter when you visit this month. Check the schedule for your choices when you're in town; acts for 2018 include Clutch, Jessie J, The Dead South, Jonathan Davis of Korn, Alice in Chains, ZHU, Hobo Johnson & The Lovemakers, Amanda Miguel & Diego Verdaguer, The Damned, and FIDLAR. Each year, The Professional Theatre at Utah University produces a series of Tony Award-winning theater in Cedar City for the annual Utah Shakespeare Festival with performances taking place from June 29 through October 13, 2018. This year, "Othello," "The Foreigner," "An Iliad," "and The Liar" will all have performances in October, but "Henry IV Part One," "The Merry Wives of Windsor," "Big River," "The Merchant of Venice," and "The Greenshow" will all wrap production in September. For a complete schedule of performances and to purchase tickets for a show, visit the official website for the Utah Shakespeare Festival before you plan your trip. From Saturday, October 13 to Sunday, October 21, 2018, you have five chances to catch the Utah Opera's performance of Charles Gounod's "Romeo & Juliet," a musical adaptation of the classic Shakespeare tragedy. 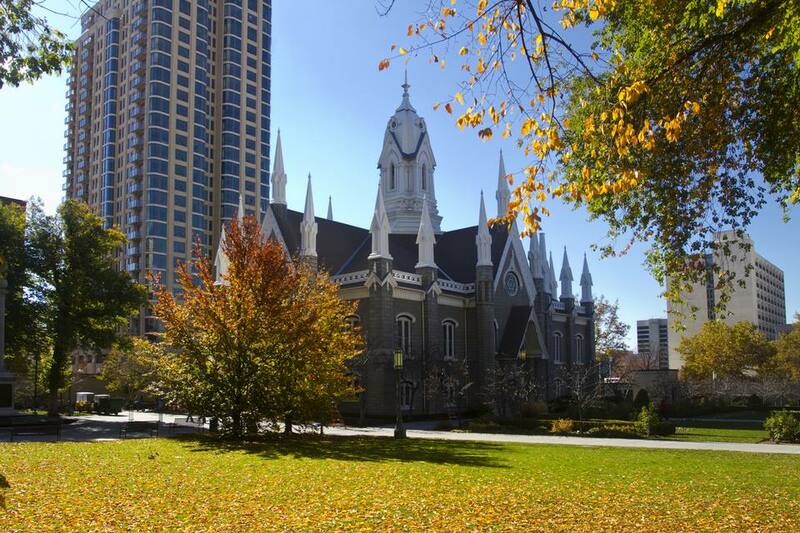 If you're an opera-lover, it might be worth planning your trip to Salt Lake City around these dates just to catch this bucket-list item. Starring Anya Matanovič and Joshua Dennis, the performance will be sung in French with English subtitles. Kids five and older are welcome to the show, but no babies in arms will be admitted to the performances. In October of 2018, you will have three chances to catch a performance of the famous Utah Symphony at their home venue, Abravanel Hall at the Salt Lake County Center for the Arts. On October 26, you can catch this symphony's open rehearsal at 10 a.m. followed by an evening performance (7:30 p.m.) of Pyotr Ilyich Tchaikovsky's "Symphony No. 4," John Corigliano's "The Red Violin," and "Three Dances" from Leonard Bernstein's "Fancy Free." There will also be an encore performance of the evening show on Friday, October 27 as well. If you're a college football fan and love Pacific-12 action, the University of Utah Utes football team will be playing two home games in Salt Lake City this October. On Friday, October 12 at 8 p.m., the Utes will take on the Arizona Wildcats and on Saturday, October 20 will face the University of Southern California Trojans. The Utes play at the Rice-Eccles Stadium on the University of Utah campus in Salt Lake City, and the Arizona game will also be televised on ESPN.